The book features profiles and short articles about interesting people and clubs. Much more than a diary, this book is an ideal Christmas present for any car-crazy individual. It’s packed with new information, historical facts and updated, hard-to-find motoring knowledge. This is in addition to important dates and carefully-researched details about next year’s motoring events. According to the publisher, Heide-Marie von der Au, the latest edition should “appeal to a broad cross-section of men and women, young or old, from casual motoring fans, to die-hard racers, passionate street rod/classic car owners, avid motorcyclists, history buffs and many other devotees”. The A5-size, hard-cover, page-a-day diary highlights upcoming races, rallies, car shows, motorcycling and aircraft events. The book features profiles and short articles about interesting people and clubs. It also contains a wealth of practical information, such as a car club index and useful repair/ restoration service providers. 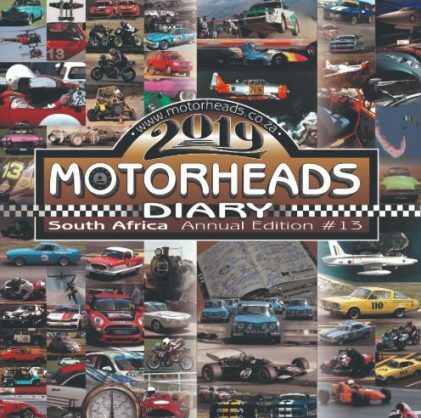 Over the past 13 years, close to 40 000 Motorheads Diaries have been printed, with more than 100 different custom cover images especially designed for individual customers. “Even in this digital age, the Motorheads Diary continues to gain popularity,” Von der Au said. It is available from a number of bookstores or direct from the publishers.